Plus, King Abdullah’s legacy, China in Africa, inter-Korean diplomacy, and more. Weekend links. U.S. President Barack Obama will arrive in India this weekend for a potentially huge bilateral summit with Prime Minister Narendra Modi. Obama has been invited to New Delhi as the chief guest at India’s Republic Day celebrations. 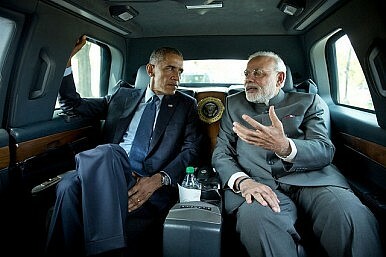 We’ve had a good deal of coverage of U.S.-India relations ahead of this visit at The Diplomat. See Harsh Pant, Prashanth Parameswaran, and Rohan Joshi’s takes on the state of the relationship and expectations for the visit. Defense ties between the two countries are at a particularly interesting place. I did a piece following Narendra Modi’s U.S. visit rounding up the major themes in U.S.-India defense ties; many of those issues will be picked up during this visit and I’ll be here to round up the pertinent details following the release of a joint statement. All this said, defense and security won’t be a major theme of the visit despite the symbolism of India’s Republic Day parade (Obama will literally preside over a display of India’s military hardware). U.S. diplomats have indicated that the primary U.S. focus will be energy cooperation and climate change, but Modi will be eager to broach the topic of defense modernization. A piece over at Businessweek takes a look at the scope for growth in India’s military spending under Narendra Modi. The big news toward the end of this week is the passing of Saudi Arabia’s King Abdullah. I reflected on King Abdullah’s legacy in the Asia-Pacific. In broad strokes, King Abdullah was responsible for bringing the kingdom toward Asia. A report over at War Is Boring highlights how China is expanding its troop presence in Africa in a bid to protect its citizens and investments. Beijing is primarily moving into the continent as its faith wanes in the ability of many African governments to secure Chinese projects from a variety of threats. North Korea has requested that South Korea lift sanctions imposed after the North sank the ROKS Cheonan in 2010. The request marks the first official response from the North Korean government to the South’s offer of holding comprehensive talks. The last significant diplomatic interaction between the two Koreas came back in October 2014 when a small delegation of senior North Korean officials visited Seoul at the conclusion of the Asian Games. The United States has finally lifted restrictions on a small tranche of military aid to the Philippines that was previously withheld over human rights concerns, Agence France-Presse reports. “The gesture affects about $15 million dollars that have been withheld over the last five years,” the report notes. This represents a very small portion of total U.S. assistance to the Philippines. The Philippines’ government recently took control of four camps of the Abu Sayyaf Group, a terrorist outfit primarily active in the country’s southern region. The group, which is based out of the islands of Jolo and Basilan, has been the target of an intensified campaign by the Filipino military.